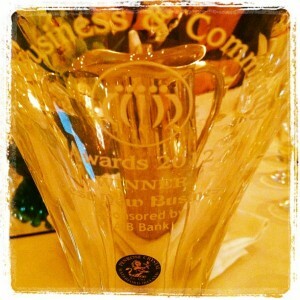 Web Content Partners is proud to announce that we won the ‘Best New Business Award’ category (sponsored by AIB Bank) at the FBD Business & Community Awards (2012) run by New Ross Chamber and adjudicated by staff at the Waterford Institute of Technology school of business. One month from today, on Friday 9 March New Ross Chamber will hold its annual awards. Tomorrow is the closing date. Getting your act in gear to type or cut and paste relevant information into the award forms could help raise the profile of your business or community organisation at a local level. The FBD Business & Community Awards is to acknowledge the talent, drive, innovation and success of the business and community groups and organisations in New Ross and the surrounding area. Individual application forms can be accessed through the New Ross Chamber website. Elaine Larkin is a director of New Ross Chamber.